The Georgia PSC approved Georgia Power's latest schedule and budget for the Vogtle Nuclear Project. The Georgia Public Service Commission unanimously approved a motion Thursday that allows for continued construction of the Vogtle nuclear expansion project. Regulators adopted a proposal put forward by Commissioner Tim Echols that greenlights Georgia Power's revised cost request and schedule largely as is, with some additional "carrot and stick" provisions designed to incentivize project completion. "As an energy commissioner, I understand the energy/climate issues and the tradeoffs of the day. That is why I drive an electric car and put solar thermal on my Winterville home," said Echols, in an email. "Yet, I really want to finish this new nuclear plant -- the only one of its kind in North America. It is important for baseload reliability, national security and climate goals." The final decision, after several rounds of hearings this fall, came down to a decision on ratepayers shouldering the financial burden of a lengthened schedule and increased costs for the two-reactor expansion. In an August construction update, Georgia Power said the two new reactors should be finished by 2022. That puts the project five years behind schedule and up to $9 billion over budget on original estimates. By that time, the new reactors could have a full price tag of up to $25 billion. One of the key provisions in Thursday's decision reduces the utility's capital and construction cost request from roughly $8.9 billion to $7.3 billion. However, the change merely subtracts the $1.6 billion Toshiba recently paid Georgia Power for the project. On top of the construction cost is an assumed financing cost, which stakeholders say puts the total amount around $10.5 billion. Echols' motion, which intervenors are still assessing, reduces the profit Georgia Power will receive from the Vogtle expansion by $700 million. This change should serve "as a powerful incentive to the Company to work as fast and safely as they can to finish these units," according to the proposal. However, opponents say $700 million amounts to very little given the billions of dollars Georgia Power stands to receive over the lifetime of the project. Furthermore, a haircut to Georgia Power's profits does nothing to mitigate the financial risk for ratepayers. While today's decision does not guarantee the utility will receive its full cost request until construction is complete, it does not set a cost cap or disallow any costs either. 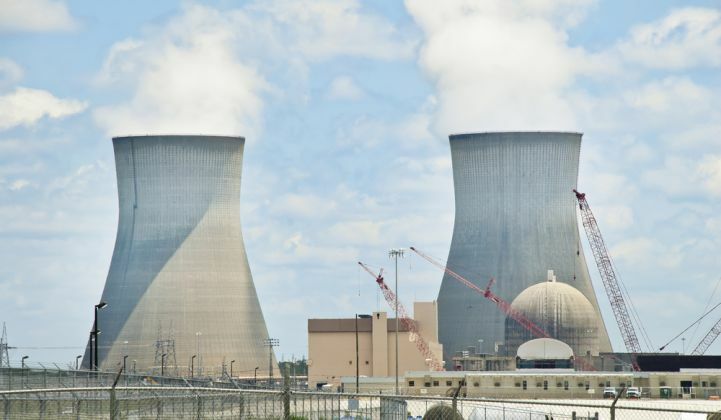 According to Jill Kysor, staff attorney at the Southern Environmental Law Center (SELC), labeling the costs as reasonable now makes it very difficult for customers to prove the costs are unreasonable in five years' time -- if and when the reactors come on-line. Georgia Power attorneys confirmed Thursday that the utility would advance the Vogtle project under the new terms. Commission Chairman Stan Wise sped up the decision timeline this fall alongside the Republican tax bill, because a lower corporate tax rate -- which is now certain to become law -- changes the possible abandonment deduction if the project dead-ends, saving ratepayers close to $150 million. Although that tax provision made it through, an extension of nuclear credits offering Vogtle about $800 million over several years did not. Nuclear advocates are hoping lawmakers reintroduce the credits in a later bill. The Georgia PSC made its latest Vogtle decision on the assumption that tax credits for nuclear would be extended and urged Congress to take action. Though the project will now go forward, it faced an uphill battle from critics. A report filed Dec. 19 by PSC staff, who are independent from the elected commissioners, recommended canceling the project. The report found that if the project exceeds $8.9 billion in “all-in” costs from Georgia Power, the nuclear project will cost more than an alternative combined-cycle power plant. Georgia Power’s latest estimate puts costs at over $10 billion for its 45.7 percent stake in the project. A 2009 law allowed the utility to collect project costs upfront from ratepayers. Those charges have so far amounted to billions of dollars. Supporters of the project argue that Georgians have already dumped so much cash into the project that it would be even more detrimental to cancel. Several members of Georgia PSC argued that the project is also necessary to ensure resource diversity and serve as a hedge against future natural-gas prices and the intermittency of renewables. Continuing Vogtle Units 3 and 4 "is cost-effective at its revised schedule and revised cost" with certain modifications, said Echols at the hearing. "Staff finds otherwise after its analysis. But everyone agrees that both analyses depend heavily on the forecast of future natural-gas prices, and we all agree we have no crystal ball on that. I am not willing to trust anyone's snapshot forecast today of future gas prices as a basis for abandoning the nearly $5 billion we already have invested in this 60- to 80-year asset." Earlier this month, Toshiba, Westinghouse’s parent company, came through with the remaining $3.2 billion of a $3.68 billion guarantee it made after Westinghouse went bankrupt. According to Georgia Power, the payment reduces the cost of the project by $1.7 billion. Today's decision ensures that payment will trickle down to customers. Echols proposed labeling the payment, to be dispensed in $25 increments, as a separate line item on customers' bills and naming it the "Vogtle Settlement Refund." The March bankruptcy declaration from Westinghouse, which was manufacturing the project’s AP1000 reactors, thrust Vogtle and the since-canceled V.C. Summer Plant into deeper economic peril. Though the V.C. Summer project did not survive, it appears Vogtle will not suffer the same fate as the South Carolina plant. The PSC decision offers an infusion of hope for large-scale nuclear in the U.S. Many monitoring the project had categorized it as the last chance to prove the viability of the industry. It’s the only nuclear project currently under construction in the nation.